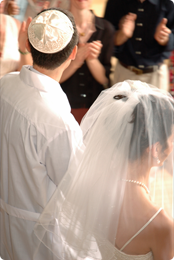 A wedding is the highlight of every Jewish girl's life, so a Toastmaster that understands and is accommodating to your needs is a must. A professional Toastmaster will ensure that your day runs smoothly, enabling you and your guests to enjoy the event, hassle-free. Using his or her experience and professional manner, the Toastmaster will guarantee that your special day will unfold just as you planned. He or she will create a friendly atmosphere which is as formal or informal as you wish, will reassure the nervous, and add an extra touch of colour and sparkle to make your day even more special, especially for the bridal couple. By supporting the wedding party, chefs, caterers, photographers and musicians alike, a Toastmaster will ensure that everyone gives their best performance. Click here to contact Philip Gardner today to discuss your requirements for your special day.